Remember when autumn meant making a pot of soup, pulling out the leaf rake, and spending an afternoon raking leaves into backyard piles for kids and dogs to enjoy? Life in the fast lane has changed all that, degrading the quality of life on many fronts. According to Quiet Communities –a national non-profit organization dedicated to protecting our health, environment, and quality of life from the excessive use of industrial outdoor maintenance equipment—tasks once done manually are now often done with gas-powered machinery. A manicured aesthetic has become the new norm in many communities that barely tolerate even small amounts of leaves or debris. As a result suburban landscapes have lost critical “messy” habitat that insects and other vital species need to live, leading to a loss of biodiversity. 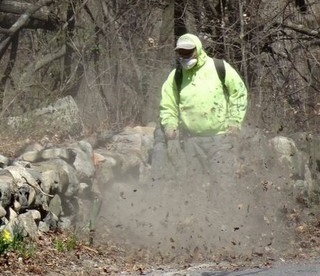 No one wants to breathe in the polluted air created by gas-powered leaf blowers. Photo © Quiet Communities. The deafening roar of gas-powered leaf blowers (GLBs) has replaced the “woosh, woosh” of the rake, and painful noise is just a small, if most noticeable, part of the trouble GLBs cause. Their motors send particulate matter into the air at 200 m.p.h., spewing forth dust, mold, pollen, pesticides, rodent feces, lead, arsenic, other heavy metals, fertilizers, fungicides, and herbicides right into our lungs. These particles aggravate asthma, bronchitis, emphysema, and allergies; in fact, particulates have recently overtaken second-hand smoke as the second greatest cause of lung cancer after smoking. One GLB produces as much smog as 17 cars and blows 5 pounds of particulate matter into the air per hour, affecting the air of 8-14 neighboring properties. “Every time the leaf blowers are in our neighborhood, my son starts wheezing and has to use his inhaler,” said one father in Huntington, New York. Those are just a few of the reasons a group called Huntington C.A.L.M. (Citizens Appeal for Leafblower Moderation) has formed to educate local citizens about the harm caused by unregulated two-stroke Gas Leaf Blowers. The group’s goal is to limit the use of GLBs by commercial landscapers during summertime when more people are outdoors. Suffolk County received a grade of “F” for air quality for the last 14 years, and this group hopes to improve our air by placing a summertime restriction on GLBs in Huntington. To learn more about how you can make healthier landscape decisions, come to CCE Suffolk’s Managing Landscapes Sustainably conference in Ronkonkoma on November 12. One of the speakers includes Jamie Banks, PhD, MS, Executive Director of Quiet Communities, an environmentalist and health-care scientist dedicated to promoting clean, healthy, quiet, and sustainable landscaping and agricultural practices. This entry was posted in Long Island gardening, Sustainable landscapes, Wildlife habitat and tagged CCE Suffolk, gas-powered leaf blowers, GLBs, Huntington C.A.L.M. (Citizens Appeal for Leafblower Moderation), Jamie Banks, lung diseases, Managing Landscapes Sustainably on October 26, 2015 by Robin Simmen.